Sunday night: Clouds and fog. Mid and upper 30s. Monday: Cloudy with showers turning to rain after dark. Winds increase along the coast. Upper 40s. Tuesday: Early showers, then peeks of afternoon sun. Near 50. Today's storm, bringing us overnight rain, continues to lift out of New England today. We'll have some relief from the wet weather Monday morning. Rain then returns over the course of the afternoon, becoming heavy at night. 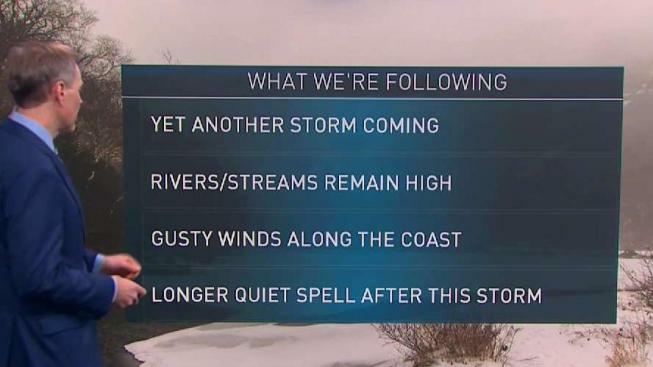 The mountains of Vermont, New Hampshire, and Maine will see six to nine-plus inches, based on the storm’s current projected path. This wet month shows no sign of letting up, with yet another round of rain and snow headed to New England on Monday. This comes after more than oneinch of rain fell in parts of Southern New England overnight. That first storm, bringing us the overnight rain, continued to lift out of New England today. Aside from a few spotty showers most of the day was dry and cloudy. Temperatures will be in the 30s and 40s. Winds gradually diminished, after being gusty at the coast. Our brief break continues into Monday morning, which will also be dry. Rain then returns over the course of the afternoon, becoming heavy at night. Another half- to one-inch of rain is on the way for many, pushing some rivers close to minor flood stage. This will be the wettest November on record for some towns as well. While this will be all rain in Southern New England, the high terrain of far Western and Northern New England will see a wintry mix and snow. That mountain snow will continue into Tuesday, while we quickly dry out, and partially clear out, in Southern New England on Tuesday. A dusting to an inch is possible in parts of Southern New Hampshire, with one to three inches expected just away from the Maine coast, into Central New Hampshire, and through the hills of Western Massachusetts. More like three to six inches is likely through a good portion of Vermont, Northern New Hampshire, and Central Maine. Wednesday will bring back a blend of sun and clouds with highs in the 30s and 40s, but we still may have a few flurries or snow showers. The end of the week looks quiet, before another soaker approaches towards the end of next weekend.